Alright, so I'm half Middle Eastern. Meaning, I grew up eating GREAT hummus. Then I permanently moved to the states, and I get far less great hummus that I would like. Normally, I go to Trader Joe's and buy a tub of it. I then devour that with some pita chips and call it a day. My ancestors are rolling in their graves, but it's the truth. 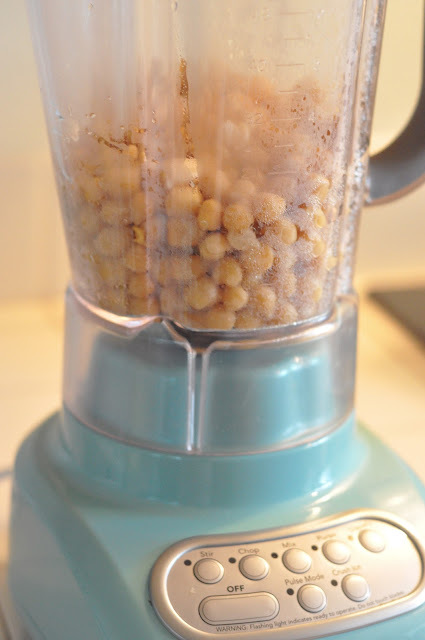 The other day, I soaked some garbanzo beans. I had no clear idea of what I was going to do with them once they were ready to cook. I thought possibly a lamb dish cooked in a tomato chic pea broth. Well, one thing led to another, and I didn't really feel like cooking lamb. So, I decided a big dish of hummus would do. And somehow, even though I had never made hummus before in my life (and always had this idea that it was impossible to perfect), I knew it was going to be easy. And that it was! So, you'll need a blender. 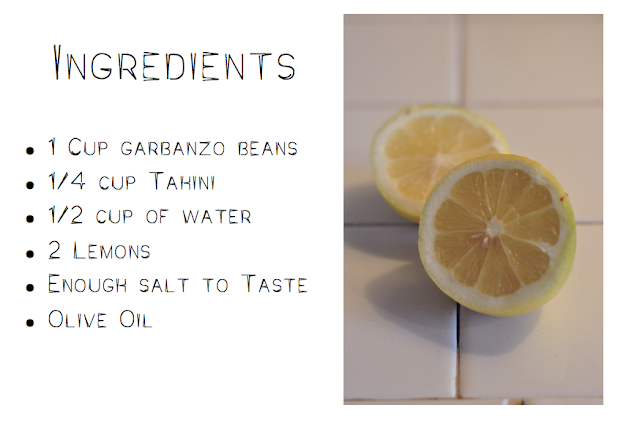 Some lemons, olive oil, tahini, garbanzo beans and salt. I know everyone likes to get creative with roasted peppers, tomatoes or garlic, but I'll tell you here and now, real hummus is simple with a lemony zing. When I made it, I eyeballed everything until I reached the desired texture and consistency. 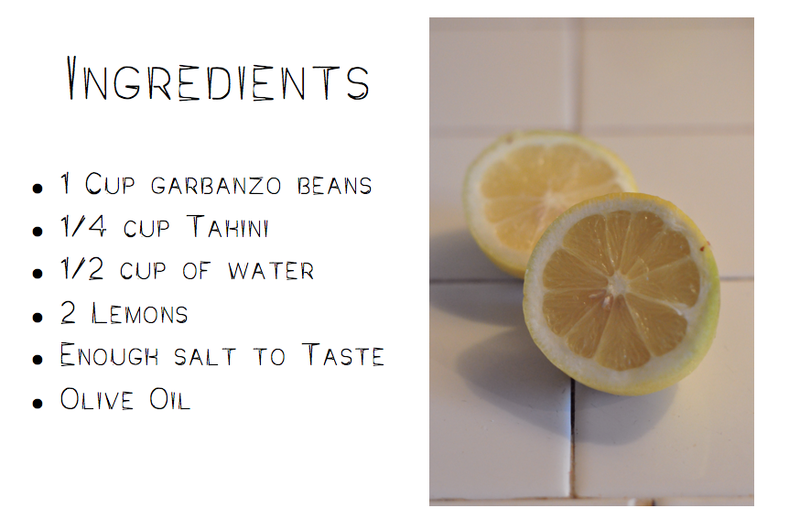 But I know that might be harder for some hummus newbies, so I tried to come up with some amounts to help. I soaked and then boiled my beans, but some of you might want to just buy them canned. Either works. If canned, they are ready to go once opened. If soaked and boiled, you will want to soak the dried beans the whole day (or overnight) and then boil them on low for an hour or so. Once the beans are ready, place them in your blender. Pour in the half cup of water. Like I said before, I always eyeball it. In my case, I poured in half an inch of water, blended the beans and then added more water. Basically the water helps the beans blend and ensures that the hummus is not too thick. Once you've got the beans roughly blended, add the tahini (this will make the soft smooth consistency) and pour olive oil over (eyeball this). Blend once more, this time for a while, while you see the mixture becoming soft and pasty. Add the two lemons and salt (if you are not as into the tangy lemon taste go for one. I say, the more the merrier). Blend some more. I say blend! Just let it go, getting softer and softer. Once you feel like its super creamy and tastes great. Spoon it into a decorative bowl, garnish with some garbanzo beans or parsley, cover with plastic wrap and refrigerate. When it's time to serve the hummus, pour olive oil over it.